When I was nine years old, a family friend gifted me with a branch of plastic cherry blossoms. I tied it to a pin board above my bed, wrote a haiku about Kyoto in the spring (though I’d never been at the time), then drew a pagoda and cherry trees beside the poem. It was an obsession fueled by lunch breaks spent in the school library, where I returned time and again to a thick hardcover book on the Japanese city. 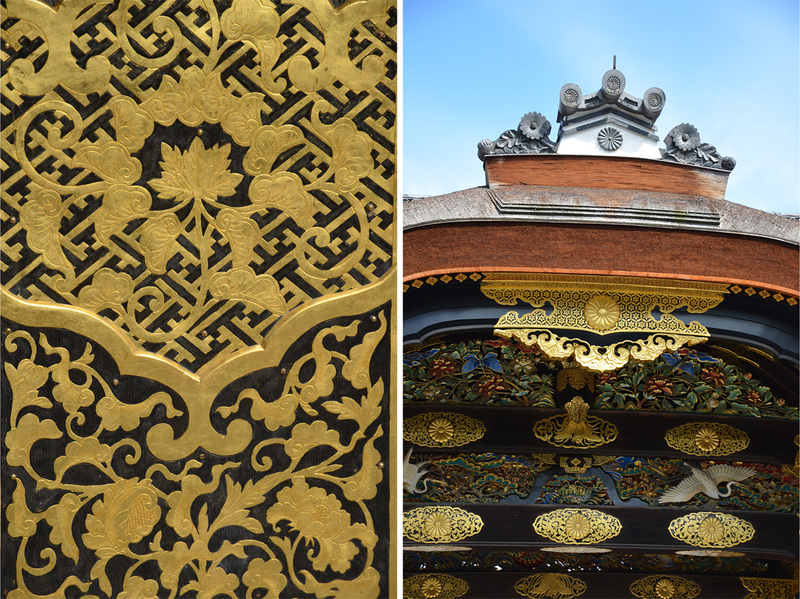 Looking through its vivid descriptions and full-page photographs, I imagined what it would be like to walk in the rain outside Sanmon, the monumental temple gate of Chion-in, and admire the Golden Pavilion across the still waters of its reflective pond. I loved Kyoto long before I set foot on its streets, or rather, I loved the idea of going there. Then I had the great fortune of visiting not once, but twice. The first time was on a hectic whistle-stop bus tour between Osaka and Tokyo. Even at that tender age, I was bewildered by the fact that our tour group only ate at Chinese restaurants throughout the trip. Japanese diners, sushi joints, and izakaya bars are a dime a dozen in Hong Kong, though it may not have been the case while I was growing up. 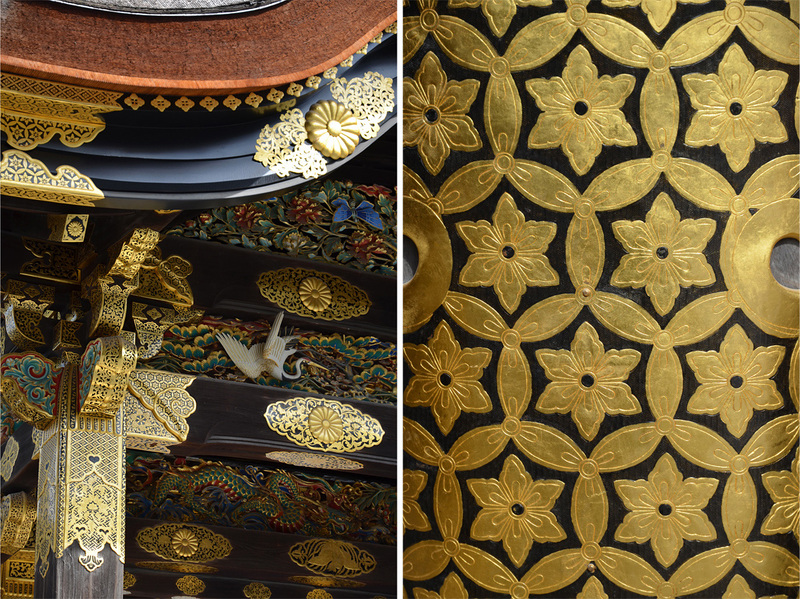 In Kyoto, my mother and I asked our Cantonese tour guide why Nijo Castle, with its chirping “nightingale floors” designed to warn of palace intruders, was not on the itinerary. “Because every Japanese castle is the same,” he flatly replied. A few years later, we embarked on a three-generation family trip during cherry blossom season. There were so many of us – including my mother’s five siblings and their respective families – that we even had to book our own coach. I distinctly remember having group pictures taken at the Golden Pavilion (still a remarkable sight under cloudy skies), bounding across the stepping stones in a garden pond at Heian Shrine, and marveling at the bursts of cherry blossom lining the Philosopher’s Walk. Equally memorable was our lunch at a traditional vegetarian restaurant specializing in tofu, which only sated my pescetarian mother. The rest of us, desiring a little more sustenance, eventually did the unthinkable – we stopped the tour bus outside a McDonald’s for burgers and fries. It’s a story my grandparents still laugh about. It could be said that eating McDonald’s in Kyoto is especially jarring because it is the antithesis of what the city represents to so many travelers. Its name alone conjures up a vision of classical Japan: vermilion Shinto shrines and magnificent Buddhist temples; sublime gardens of raked sand, moss, and strategically placed rocks; an immaculately dressed (and coiffed) geisha holding an exquisite oil-paper umbrella. 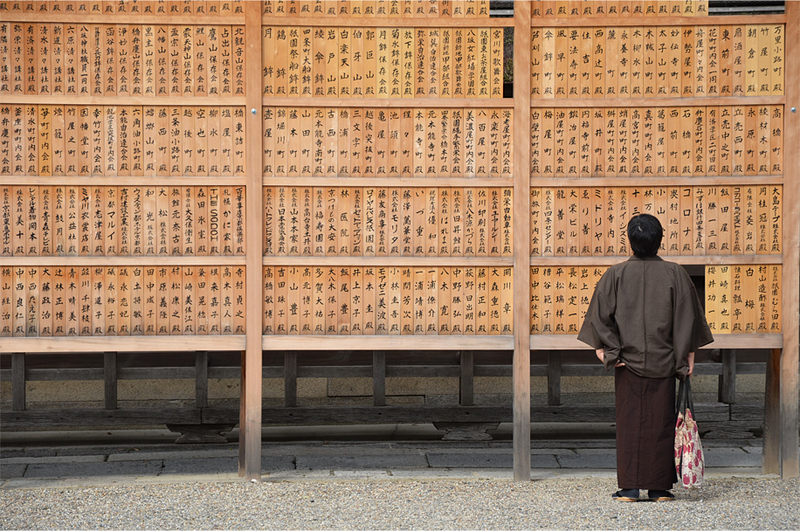 In other words, Kyoto implies beauty, refinement, and a heightened level of sophistication. Given its history as the seat of the Japanese imperial court for more than a thousand years (until the emperor relocated to Tokyo in 1869), perhaps that shouldn’t come as a surprise. The eventual departure of both crown and government spelled an end to Kyoto’s dominance on the national stage, though the new capital would suffer from greater problems of its own. Tokyo was destroyed twice in the first half of the 20th century – first by a catastrophic earthquake and ensuing firestorm in 1923, then the bombing raids of World War II. Kyoto, on the other hand, became the only major city in Japan that was largely spared from Allied bombardment. But in the summer of 1945, the threat of another calamity loomed on the horizon. The story goes that Kyoto was earmarked as a top potential target for the atomic bomb – until U.S. Secretary of War Henry L. Stimson took notice. When the military disobeyed his order to take it off the list, he successfully lobbied President Truman to do so, just two weeks before “Little Boy” was dropped on Hiroshima. Stimson argued that Kyoto’s cultural significance was so great that its wholesale destruction would never be forgiven by the Japanese. 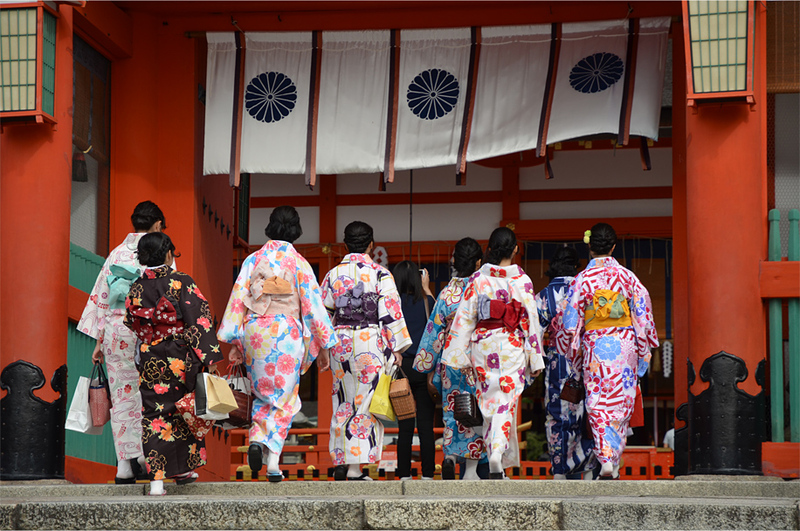 Behind this reasoning lay a deep personal connection: Kyoto was a city Stimson loved, and the setting of his honeymoon several decades before. But the postwar boom has wiped away much of what Stimson saved from a fiery end. 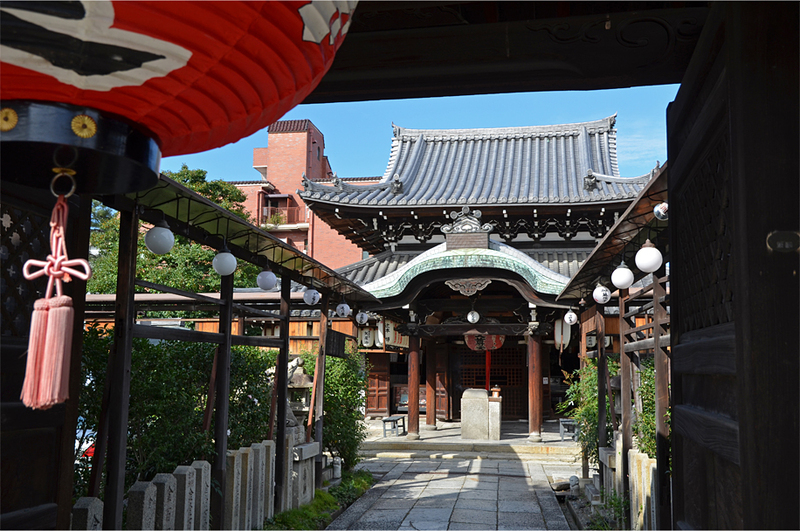 The traditional wooden townhouses called machiya, long a defining feature of the cityscape, have become increasingly rare. Modern-day visitors might bemoan the fact that, upon leaving the monolithic, 15-story train station, Kyoto resembles any other Japanese city – a sprawl of concrete boxes, drab apartment buildings, kitschy, flourescent-lit pachinko (pinball) parlors, and nondescript houses on narrow lots. Still, for all the modernity that is 21st-century Kyoto, glimpses of its illustrious past remain dotted around the city. 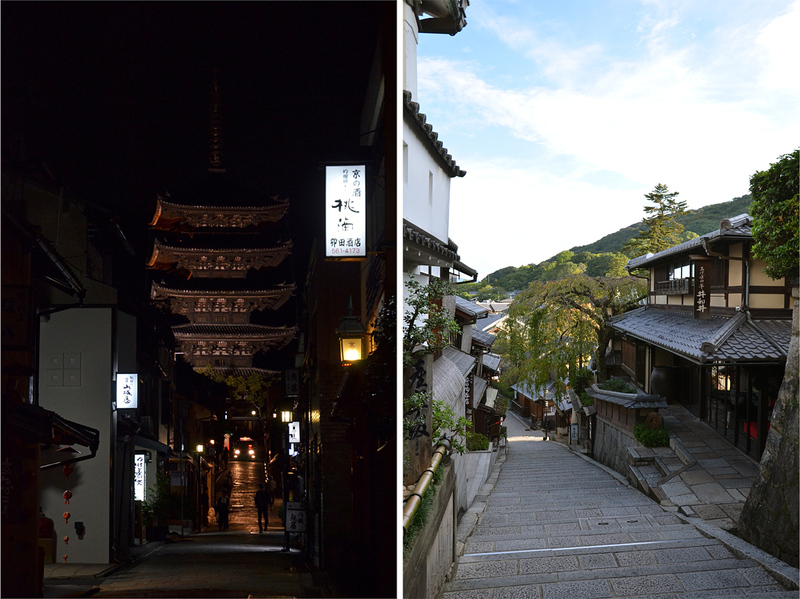 Wandering the eastern district of Higashiyama by night, you might glance down a narrow street to find the floodlit Yasaka Pagoda, a lone sentinel that has weathered the elements since the 1400s. 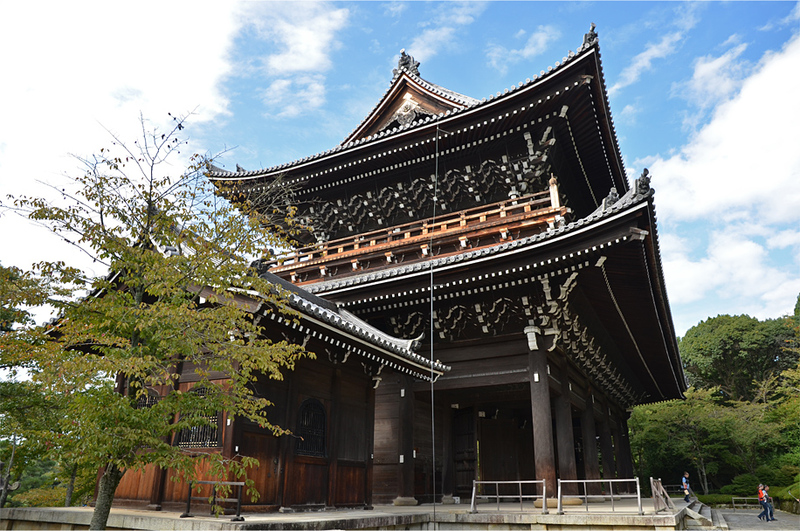 Long before our trip last October, I knew that Bama would never be bored in Kyoto; so great is his love for ancient architecture that it is impossible for him to be “templed out” even after several weeks of exploration. 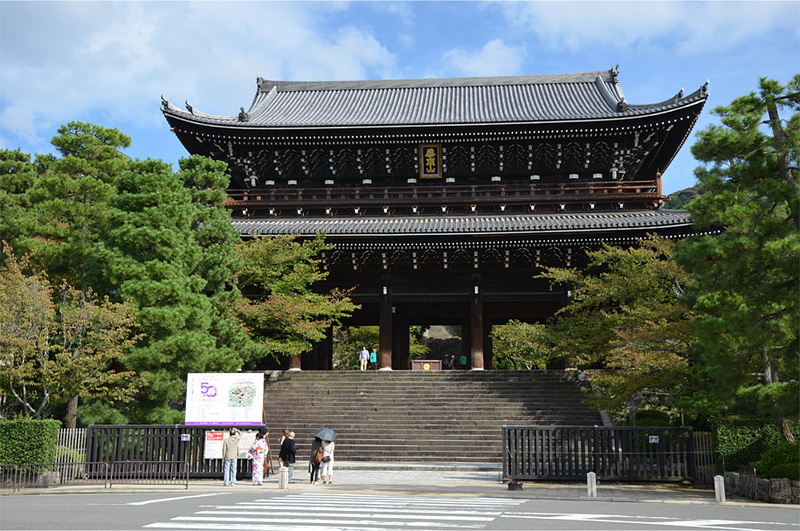 We spent most of our days hopping between various temples and shrines, many of them places I’d last visited as a 14-year-old. Ever the early riser, Bama dragged me out of bed at half past five so we could get to the major sights first thing in the morning, before the crowds could descend and ruin our photographs. “But I thought we were on holiday,” I lamented. Needless to say, those efforts paid off. 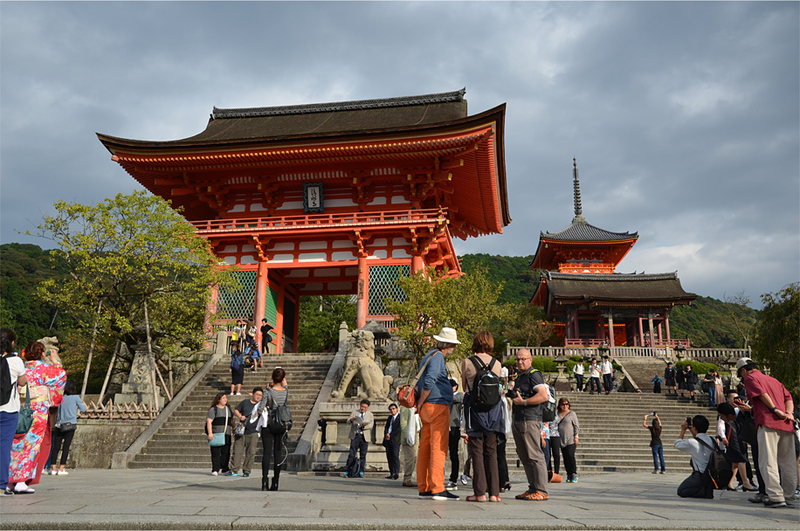 The great hillside temple of Kiyomizu-dera, easily one of the most popular attractions in town, was almost deserted when we arrived a quarter after seven. 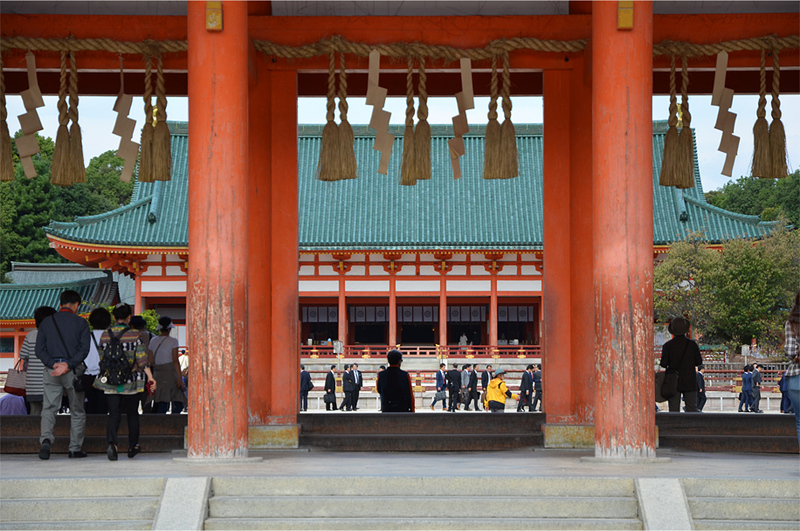 Bama and I reached the gates of Kinkaku-ji – the Temple of the Golden Pavilion – 20 minutes before opening time, joining a small number of fellow overseas visitors and a growing legion of Japanese schoolchildren. When we weren’t taking hundreds of photos or getting around by local buses and trains, Bama and I found time to relax in the comfort of our cozy hotel room. I chose a place in Higashiyama partially because I’d remembered the wooden townhouses lining the approach to Kiyomizu-dera; the other reason was its proximity to a slew of important temples and shrines. Our lodgings had the outward appearance of a tiny, traditional hotel, though it was anything but. After keying in an access code sent to us by email, we checked in via one of two iPads attached to the unmanned reception desk. But the lack of human interaction was more than made up for by the conveniences found within: our room had a kitchenette equipped with a fridge, microwave, and a large sink; a state-of-the-art washing machine and dryer (with tablets included); and, in lieu of a space-hogging sofa, soft cushions placed around a low table facing the flat-screen TV. Tatami mats and shoji screens lent the space a traditional feel, while the glass sliding doors in the living area opened onto a small pebbled courtyard. As the hotel was ­in a low-key residential area, we often frequented a Japanese convenience store some 10-15 minutes away to stock up on food, cold drinks, and bottled water. FamilyMart became our primary source of breakfast and dinner, not least because it sold the best microwave meals that have ever passed our lips. Bama and I both loved the restaurant-quality beef curry udon, not to mention the indulgent spaghetti in tomato and cream sauce, served with uni (sea urchin) for an unmistakably Japanese flair. It wasn’t until our penultimate night in Kyoto that we discovered Sagan, a neighborhood coffee shop just two blocks from the hotel. 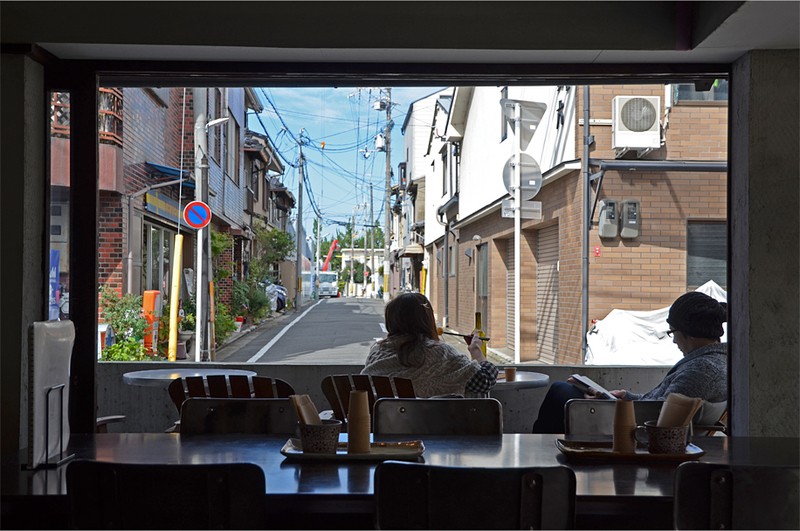 Housed within a tastefully modernized machiya, its airy, restrained interiors of exposed concrete and whitewashed walls looked straight out of Monocle. Behind the counter, a lone staff member was baking bread in an industrial-sized oven, while the handwritten menu offered Japanese breakfasts and Kyoto home-style cuisine known as obanzai, a humble counterpoint to imperial kaiseki multi-course meals, which were wildly out of our budget. One Kyoto specialty we did splurge on was traditional pressed sushi at Izuu, a small, 200-year-old upscale restaurant in the entertainment district of Gion. 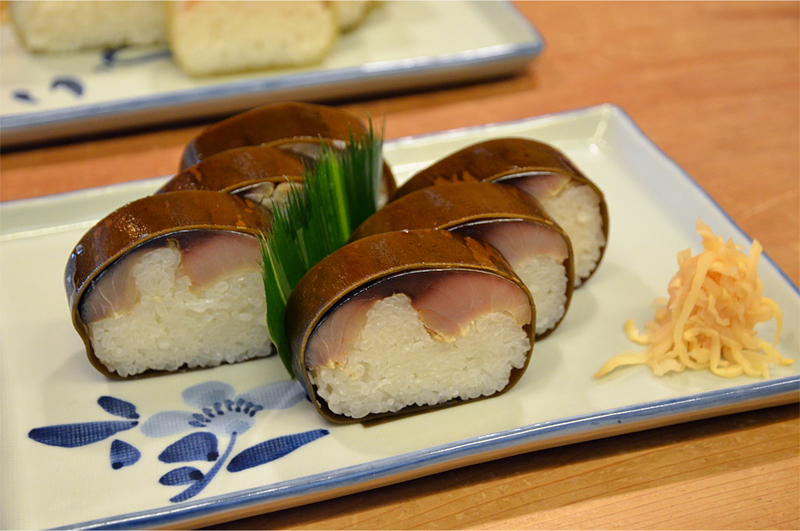 The star dish was sabazushi – hearty rolls of lightly cured mackerel and sushi rice, wrapped in a thick layer of pickled kombu (an edible kelp that is eaten separately). We also opted for tai-zushi (sea bream sushi), and together, the two plates came with a hefty price tag of roughly 5500 yen (US$48). Suddenly our regular microwave dinners seemed completely justified. Obrigado PedroL. 🙂 I haven’t written a haiku in a very long time, but it’s something to consider for a future post! What a let down that must have been that your first tour included Chinese meals when you were in Japan. I can’t get over that! Yes, it was one of those experiences that put me off going on package tours forever. Traveling independently is the way to go! I would love to go to Kyoto! 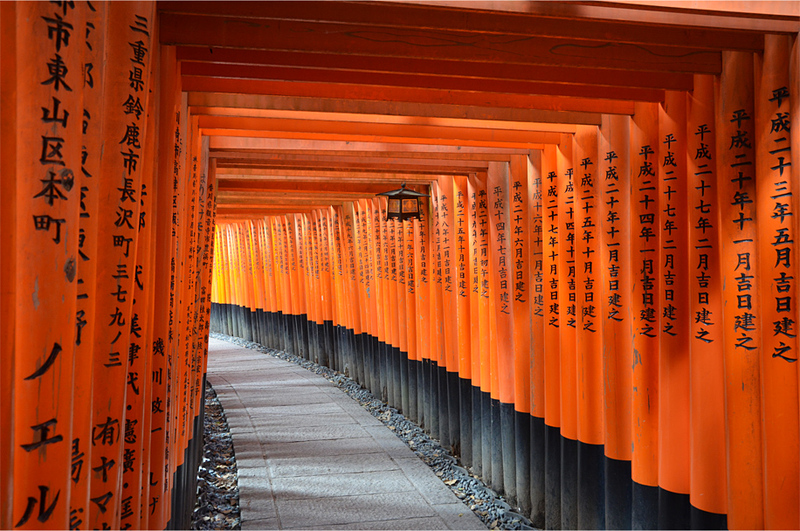 Actually I think a week in Kyoto would be great way to break up the journey between Italy and Brisbane! I came to Kyoto to see the ancient temples, but I was pleasantly surprised by the hi-tech welcome at our hotel. From the codes sent to your email, to the unmanned reception desk, the digital door lock, and the automatic toilet, I wonder if one day from the moment you leave the airport until you arrive in your hotel room, you won’t need any human interaction at all since everything will be done by technology. In spite of being the highlight for almost everyone who traveled to Japan, the city itself was much more interesting than I previously thought. 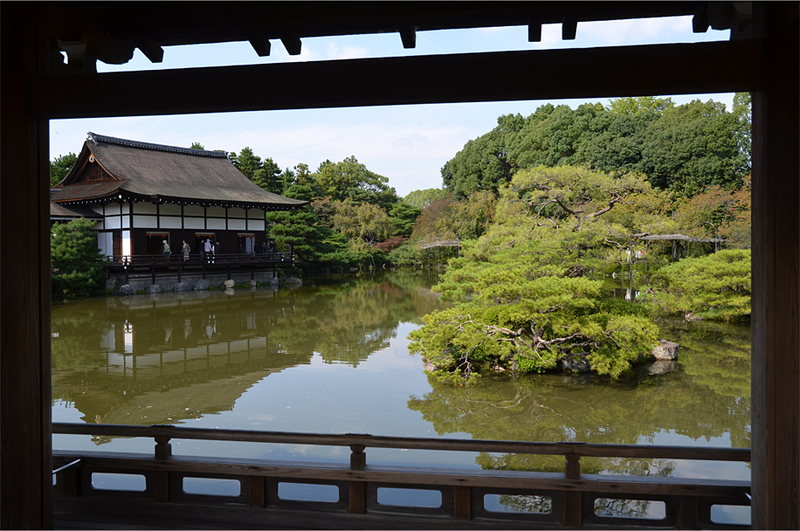 Nijo Castle was very impressive, as was Sanmon and, of course, Kinkaku-ji. Having been to Shwedagon before, my expectation of any kind of golden temple was really high. I was very careful with what to expect from Kinkaku-ji, until I saw it myself. 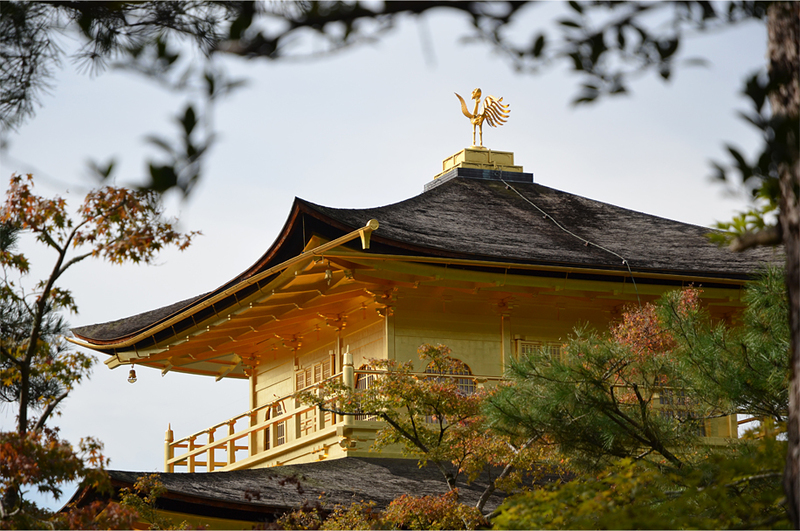 A beautiful temple in a majestic setting covered in the most sublime gold leaf. Japanese elegance at its best! It always helps to keep your expectations in check – as much as Kyoto lives up to all the hype, I didn’t want you to come away disappointed from the experience. I’m so glad it turned out to be far more than what you imagined before our trip. 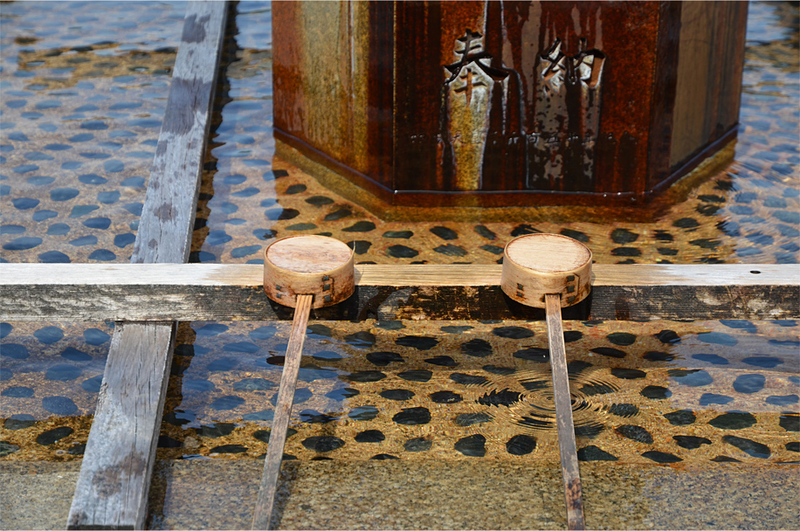 For me, going back to Kinkaku-ji was like seeing it for the first time all over again. The hi-tech welcome at the hotel was quite a novelty, though I didn’t appreciate having to fumble around with my phone in search of a WiFi hotspot! 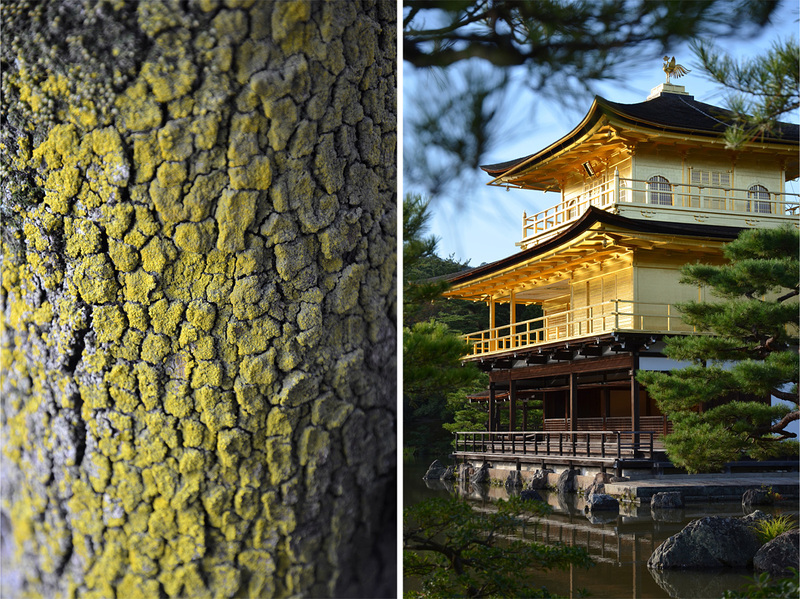 Love Kyoto and the Golden Pavilion is amazing. Great photos. 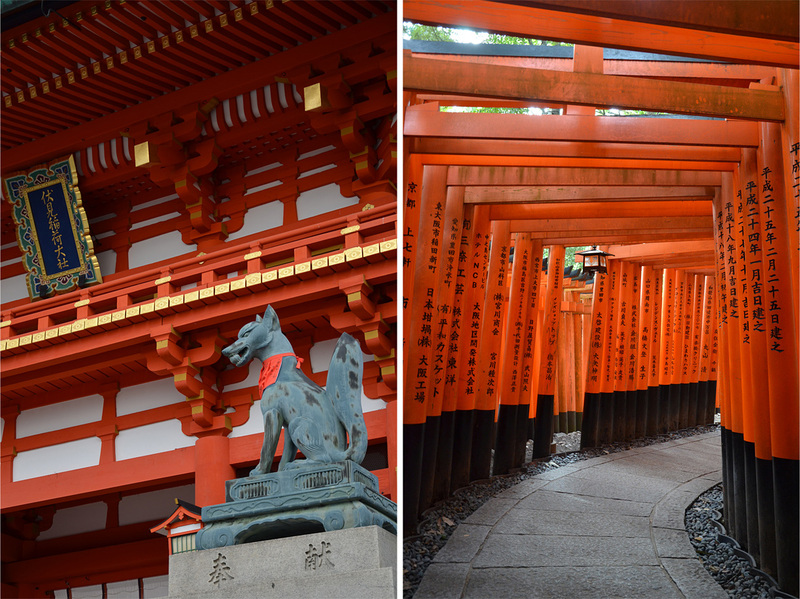 Kyoto looks absolutely amazing! Thanks for sharing James! You’re welcome, Nicole – I’m sure you’d love Kyoto! Lovely pictures and interesting post. I went to Kyoto last year and loved it. It will be one of my next few posts. I’ve yet to encounter anyone who didn’t like Kyoto. Even with all the crowds at peak season, the city somehow retains its magic. Such amazing architecture James and you have captured it beautifully. So funny about your family’s coach pulling over for a full up at McDonalds. What did your Mom think? Thanks Sue! I think my mom found it hilarious, but she could see why we went for fast food – the tofu wasn’t very satisfying to begin with, and the portions were pretty small. Oh my goodness, I’m glad I had a look at your blog a little after lunch! The photos are mouthwatering to say the least. 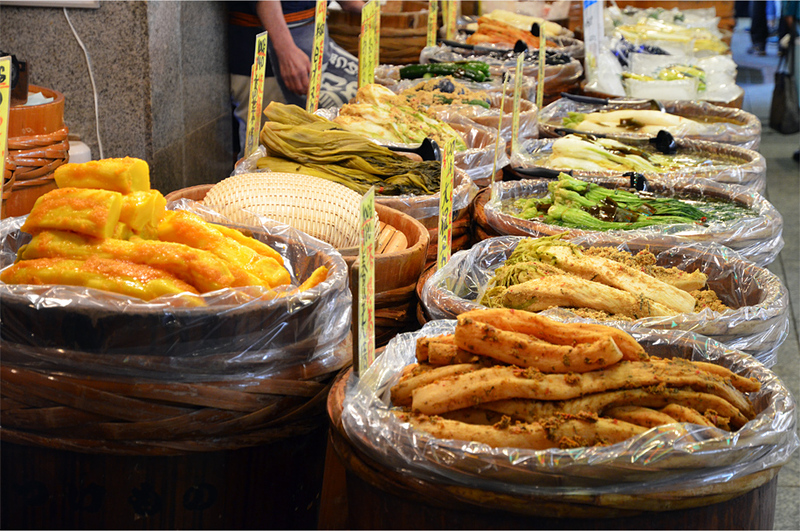 If you ever go to Kyoto, make sure you visit Nishiki Market – it’s a real foodie’s haven. Thanks so much for the kind words, Carissa. 🙂 Was it snowing at all while you were there? 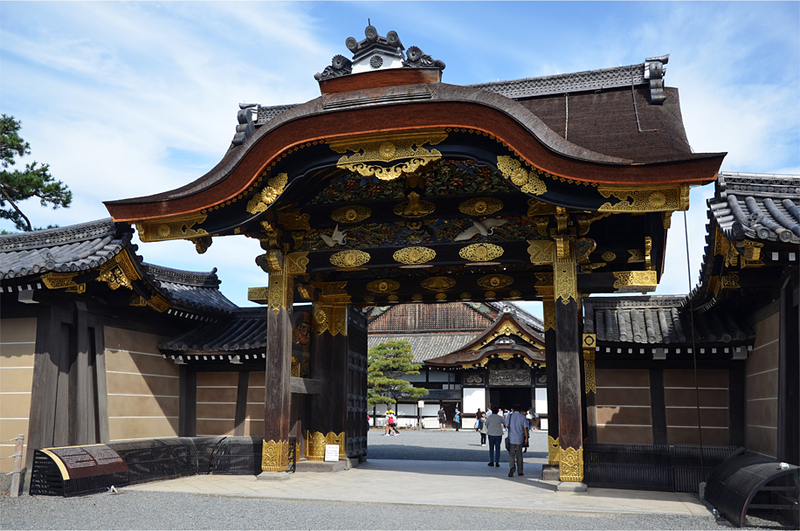 The main gate of Nijo Castle was being restored back in October, but we could still go through and see everything else. On all my recent trips, I’ve been using a Nikon D5100 with a AF-S Nikkor 16-85mm lens. 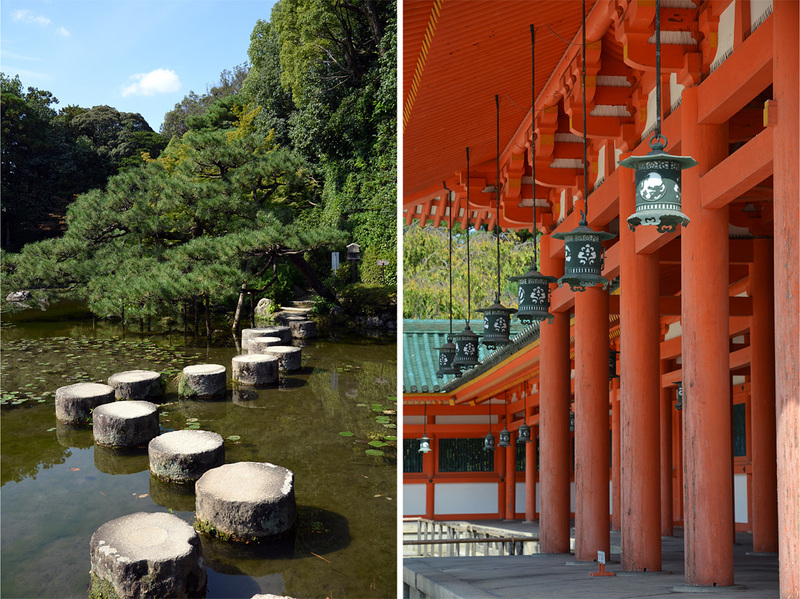 For a long time, Japan floated way down on my travel wish list, but over time, it has bubbled up higher and higher. I used to study karate and read all kinds of shogun-filled novels, but I still never moved Japan up to any kind of priority status in my travel plans. Lately, and after reading posts like this, I feel a great excitement about getting to this fascinating country, particularly Kyoto. 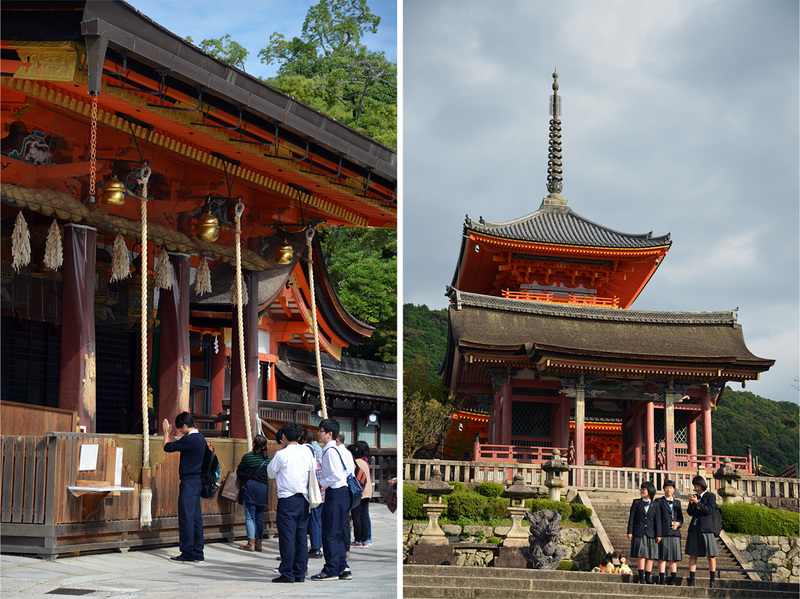 One of my options is a very cool walking trip that follows the network of ancient trade routes from Kyoto to the provincial towns of the Kiso Valley. Your photos and experiences are pushing me even harder to do this – and soon! The walking trip sounds amazing, Lex – go for it! That must be a part of the famous Nakasendo, which I myself would love to explore on a future trip. I wonder if Houston has direct flights to Osaka… if not, you might just have to transit via the West Coast. Either way, the long trip will be worth it! In my opinion, your Cantonese tour guide didn’t place himself / herself as a first timer or new visitor that, for a tourist or traveler, Nijo Castle is interesting. As travelers, we should consider that not all travelers have a same opinion about a place. Sagan looks so quiet and tempting to me. That’s a good point, Nugie. My guess is that he was just jaded after taking so many tour groups to the same places in Japan. Sadly I didn’t manage to get any decent shots of the interior at Sagan – it was such a nice place to have a relaxed meal or a cup of coffee. Great to have you here, Elisa. Thanks for reading and leaving me a comment! 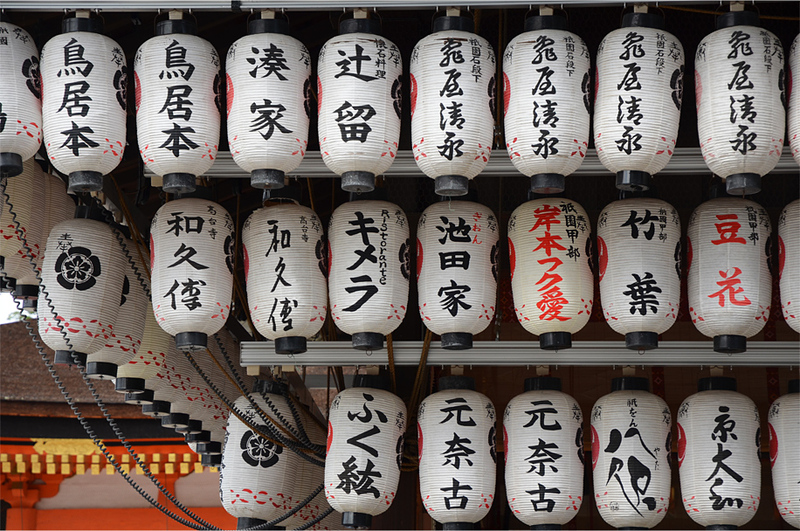 Japan is on my future travel list, and having seen your stunning photos (and read about the gorgeous food! 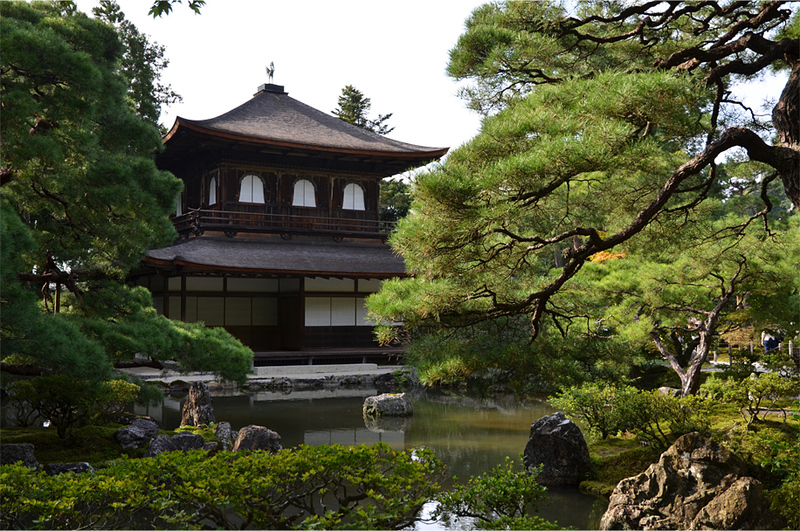 ), Kyoto is definitely the place I’d like to visit first. The food was extraordinary – I was just blown away by the quality and the care put into its preparation. Hopefully you’ll get there pretty soon! This is a great post, James. I have certainly went to McDonalds a time or two after an unsatisfying meal on the road. 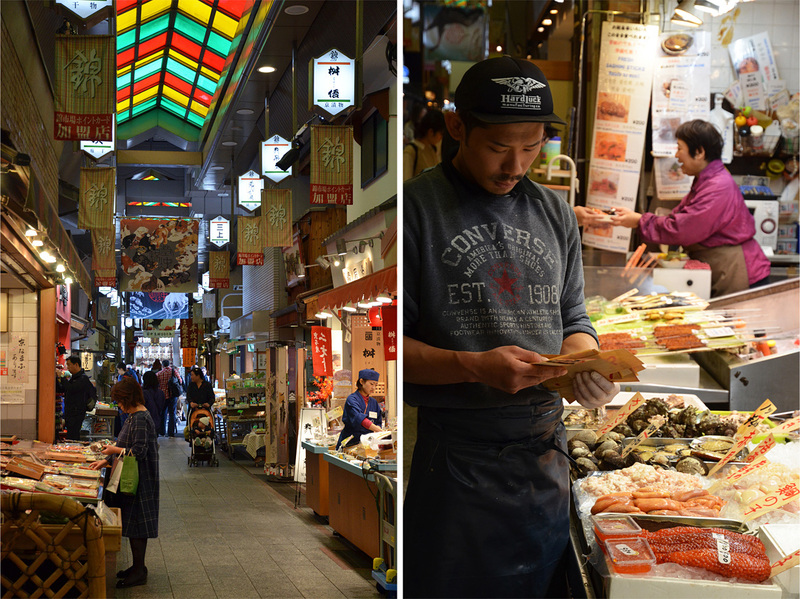 It sounds like that last meal in at the Nishiki market was pretty epic though. Those temples look like beautiful retreats with lots of nature and greenery. Are they surrounded by city or out in nature? We like to get up early and beat the crowds too – there is nothing more satisfying than leaving the place as the first tour buses are rolling in. Growing up in south-central USA, I always dreamed of visiting the Grand Canyon and the parks of Utah. Thanks, Jeff. As you already know, Bama and I went to Pizza Hut while in Pondicherry because we needed a break from Indian food! We actually had a late lunch after indulging in snacks at Nishiki Market… it was sort of justified since we walked all the way there from our hotel and back. 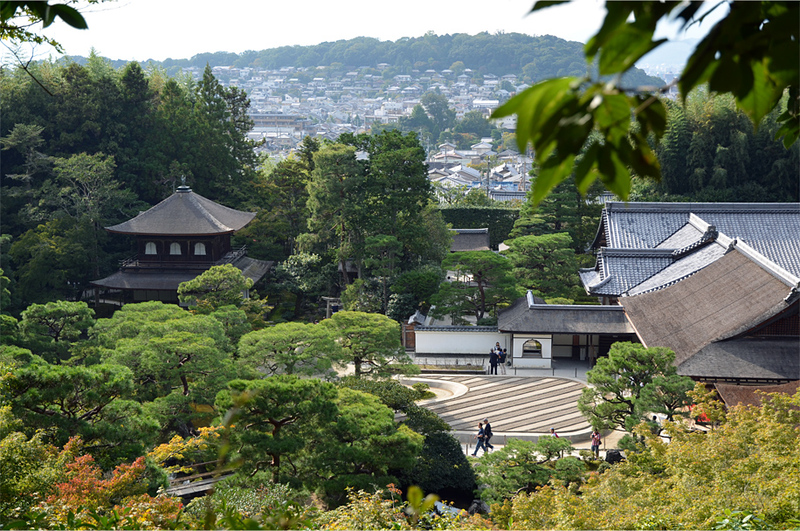 A couple of important temples/shrines are right in the middle of Kyoto (Heian Shrine being one of them), but most of the major ones tend to back onto forested hillsides on the city’s fringes. 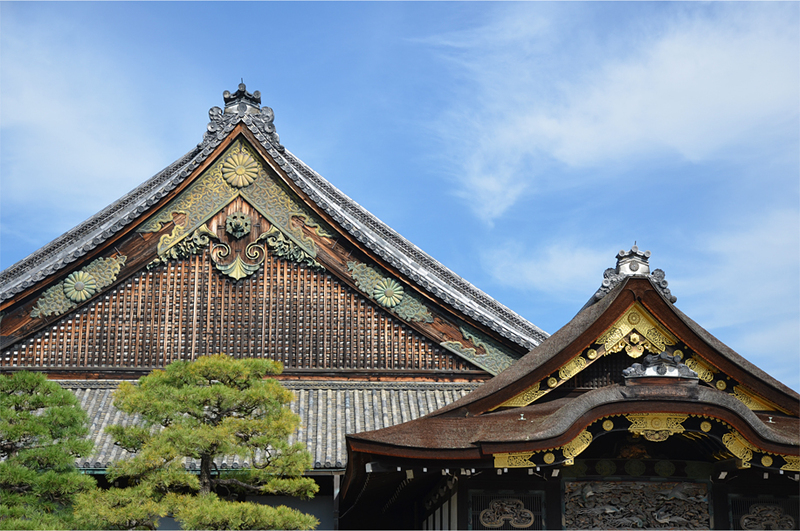 Out of these, the Golden and Silver Pavilion are set in beautifully landscaped gardens as they were once retirement villas for the Shogun. 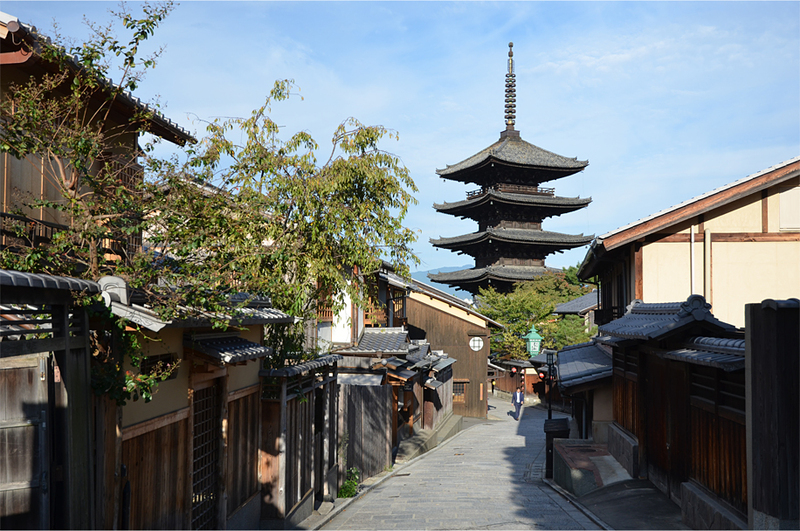 I love Kyoto, that traditional teahouses, and all the temple just gorgeous… Dont forget to try Onsen guys when visiting Kyoto. Well, your profile photo gives it away! 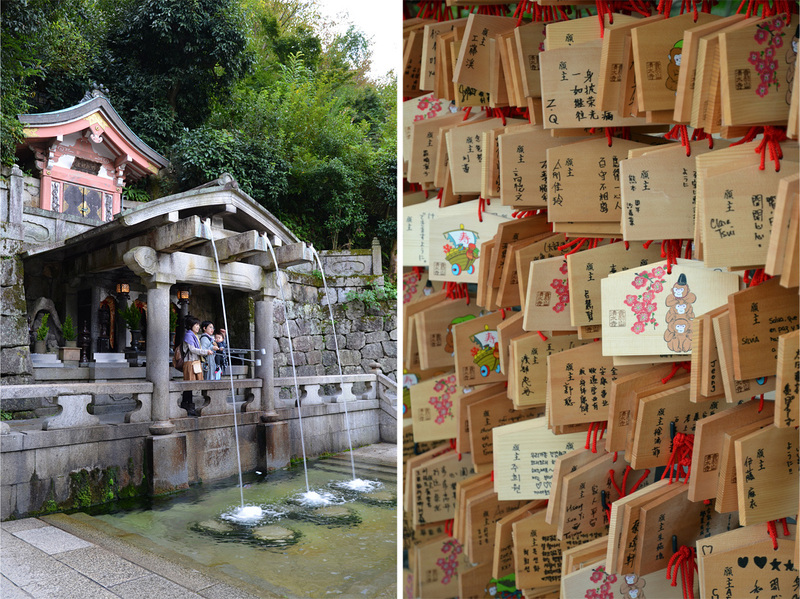 We didn’t end up going to an onsen that time, but it’s definitely on our list. I can’t wait to return to Japan. Gorgeous photos! Seeing Kyoto in the Spring is now on my bucket list. Thank you! It is magnificent when the cherry blossoms are in full bloom – though you’d have to brave the crowds of people all clamoring to see the flowers. Your photos are stunning! Amazing work! Much appreciated, Justine – thanks for the kind words! These pictures are breathtaking! 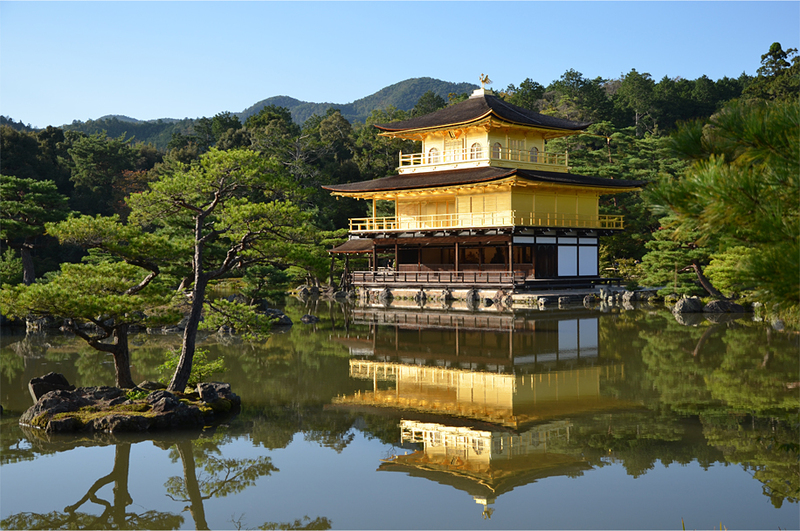 My favorite is the golden pavilion! Oh how the water and the color take my breath way/ You describe it so well! You are fortunate to have been twice.